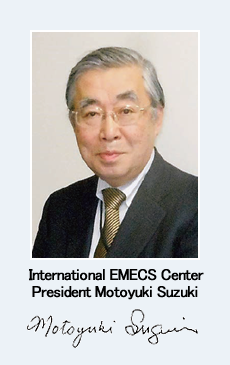 In 1990, recognizing that environmental deterioration in enclosed coastal seas had become a serious problem, a problem common to the Seto Inland Sea, Chesapeake Bay, the Baltic Sea, the Mediterranean and other enclosed coastal seas throughout the world, representatives from these areas came to Kobe, Japan for the 1st International Conference on the Environmental Management of Enclosed Coastal Seas (EMECS). Change (UNFCCC) was adopted. It was a time when consensus-forming was needed on a global scale, both to determine how to reduce global warming that was already occurring, and these e旺orts have continued to this day. However, in the 20 years leading up to the “Rio+20” conference in 2012, the world’s population has increased 30%, and global production has grown by approximately 2.5 times. In this way, human activity on our finite planet continues to increase rapidly in terms of both volume and density. The ocean is the mother of all life on Earth. The oceans contain various ions that constitute essential elements that are indispensable for the development of living organisms. Climate change also has a major impact on the ocean in terms of sea level rise, acidification of seawater, changes in marine ecosystem structures and so on. Furthermore, as the population continues to increase, a variety of impacts caused by human activities on land areas continues to increase as well. The oceans receive solar energy and generate water vapor. This water vapor condenses in the air overhead to form clouds, some of which produce rain that falls on land. This water cycle creates a balance of energy on Earth, thereby producing the temperature environment that is suitable for life. This rain is also the source of fresh water that provides the basic support for all life on land. It also functions to wash away all of the man-made substances emitted from human activities into the ocean. It is the coastal zones that are most severely affected by this pollutant load. Therefore, enclose coastal seas can be considered to be the quintessential model of coastal zones. The oceans teach humanity both the severity and benevolence of nature, and they are also a valuable entity that supports the source of life of Earth. As a first step toward developing respect for the ocean and preserving its crucial mechanisms, it is essential to recognize the need to maintain healthy ecosystems in the coastal zones in particular. The oceans are enormous – so vast that they were once thought to be limitless, and the impact of human activity on them was once thought to be limited. Ultimately, however, the oceans can be thought of as large enclosed coastal seas bordered by land. The substances that flow into these enclosed coastal seas accumulate, undergo various changes and eventually affect ocean systems. In recent years, various chemical substances have come to be used in human activities, and various pollutant loads are swept away from land to sea through rivers, sewerage systems and other means. In order to maintain the health of ocean regions, we must develop a clear understanding of the unique attributes of anthropogenic activities within various rivershed areas, and use this understanding as a basis for establishing more universal and comprehensive management systems. Based on this perspective, the International EMECS Center considers it essential for scientists, policymakers, the private sector and citizens from a wide range of fields both at home and abroad to come together to exchange information and ideas aimed at creating healthy ocean environments in enclosed coastal seas, coastal zones and the open sea. To ensure that these activities will continue, it is also important to encourage young people to join in these efforts for the future conservation of our mother ocean.